The Insolvency Service are the regulatory body for the insolvency profession in the UK. 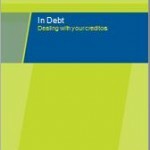 They have published a free, impartial guide called “In Debt? Dealing With Your Creditors” which can be downloaded by clicking on the guide or by visiting from their website here.